In a heavy based pan (of sufficient size to accommodate all the ingredients) heat a couple of tablespoons of olive oil, add the onions and the celery, fry on a medium heat until the onions become translucent. Now add the garlic, give it a stir and fry everything for 5 minutes. Season the chicken with salt and pepper and add to the pan. Brown on both sides. Once the chicken has a lovely golden colour, pour in the wine, bring to the boil and let it reduce by half. Add the passata or tomato puree, add more seasoning and the marjoram. 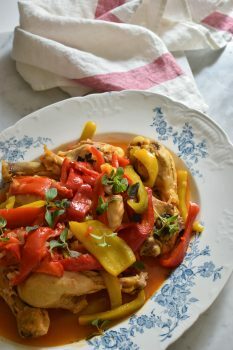 Use one third of the peppers and start to gently cook the chicken with the lid on for the next 30-40 minutes. In the meantime, in a separate pan fry the remaining peppers for about 10 minutes. Add them to the chicken and carry on cooking until the chicken is soft and peels off the bone. The peppers should be delicately cooked by then but still retain their shape.